Description: Scarce Vermont Balsam, prepared by DR. S.N. Gould of West Randolph Vt. Label is complete and in pretty good condition; For Cough, Cold, Croup and all affections of the lungs and chest ect. 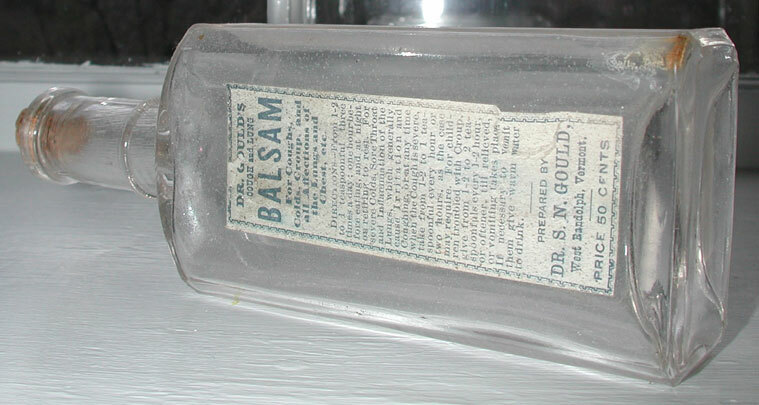 DR.S.N.GOULD also prepared Botanic Bitters and Good Samaritan Remedy also both from West Randolph, Vermont. Dr. Gould’s Botanic Bitters bottle has colorful graphics of Native Americans (see photo gallery for example). Condition: Complete label in good condition, very readable.